Arts amenities are abundant and accessible; performing arts include a recognized symphony, ballet and theater performing at the new Peace Center for the Performing Arts just off of Main Street. There are a few older mill buildings, but many have been successfully repurposed into other uses, and there is abundant quality housing close to the city, mainly north and east. Automaker BMW located its plant in nearby Greer, 7 miles east, bringing a strong economic base and making Greer an up and coming family community, albeit with some growth and sprawl issues. The BMW plant and several other new manufacturing entities, some supporting BMW, have sprung up mostly to the east towards Spartanburg to a lesser extent west in Anderson. All have contributed to a vibrant economy and plenty of new infrastructures, and living costs are still very low. Outdoor activities are plentiful, particularly in the Blue Ridge Mountains to the north and lakes to the west. The town of Clemson 25 miles west, home of Clemson University, offers college town amenities for those interested. Located on the eastern slope of the Southern Appalachian Mountains, Greenville is in rolling country about 20 miles from the first mountain ridge and 55 miles northwest of the main ridge. The climate is a mix of subtropical and continental. The mountains usually protect the area from the full force of northern cold air. Summers are warm and humid with thunderstorms. The elevation provides relatively cool nights during the summer months. Winters are pleasant, with below-freezing daytime temperatures only a few times a year. Rainfall is abundant and spread throughout the year. There are usually two to three small snowstorms and one to two episodes of freezing rain in winter. The median home price in Travelers Rest is $182,700. Browse Homes in this Range. 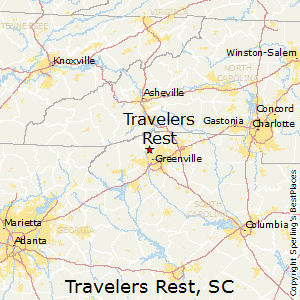 Compare Travelers Rest, South Carolina to any other place in the USA.